Bonaire is located on the Caribbean sea, it belongs to the Dutch Antilles and is the most Eastern of the below wind islands. The island is 40km long and 5 to 12km wide and it has a surface area of only 288km2. 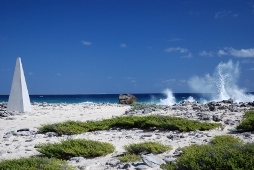 With only 15,000 inhabitants, Bonaire is one of the least populated islands of the Caribbean area. Something unique: Bonaire has no traffic lights ! The capital, Kralendijk, on the west coast is also the centre of the island. Furthermore there is actually only the authentic and old Rincon that has meaning in the inland. Outside the town centre there is a vast landscape of small beaches, lagoons, mangroves, rocks, salt plains and desert-like areas. These areas are called "the kunuku", with towering kadushi cactuses and bent divi-divi trees. The "under-water-nature" is the best in the entire Caribbean! This is not only a paradise for divers, but also for snorkelers and surfers. People often say that Bonaire has such a special appearance; an appearance that is difficult to describe with words. 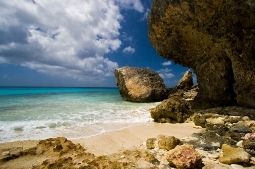 Some people say that they ï¿½fell in loveï¿½ with Bonaire. Nobody knows exactly where this feeling comes from, but it has something to do with the relaxed atmosphere, the wonderful climate, the friendly inhabitants and of course all the wonderful things that Bonaire has to offer.